The "real" Trinidad head Lighthouse is a very small tower which sits high up on a headland along California's north coast. Built in 1871, it is still in operation today, but is off-limits to the public. The town of Trinidad built this replica in 1948 in a more accessible location to the public. It houses the original fourth-order lens removed from the "real" lighthouse in 1947. The station's 1898 fog bell sits next to it. Seeing Trinidad Head from land was a huge disappointment. It was a strenuous walk, culminating with you standing on a wooden platform catching a glimpse of part of the lantern room. And it's a distant glimpse. If you run the "More Photos" slideshow above you'll see the view we had. Photos 5,6, and 7 are of Trinidad Head, with #7 being the real view (5 and 6 being zoomed in shots). You can see just how far away you are from the lantern room. If I had known this was what the view of Trinidad Head Light was like from land I wouldn't have bothered taking the time and energy to walk all the way to the viewing platform. This in no way takes away from the beauty of the area or the community of Trinidad. The people we talked to while we were there were VERY nice and the town is very scenic. But the viewing platform allowed you to see very little of the lighthouse. Walk up the steep road that leads from the parking lot until you get to the point where the road does a hairpin turn to the left and a path goes off to the right. Take the left and stay on the road. I know other directions suggest taking a right onto the path, but we felt the road was faster. Follow the road until you come up to the closed gate and the Coast Guard sign. To the right there is a path you can take up the hill. Take that path. At the top of the hill there are some communications antennas to your right. Go left. You'll see the wooden platform 50 yards or so from where you turned. Take a step up onto the platform to see the partial view of the lantern room. Gary--I wanted to also let you know that you could have walked right up to the lighthouse if you had taken the old Coast Guard road instead of turning right up the hill to the platform. Even though there is a sign there discouraging entrance to the public, you can walk right in. The resident Coast Guard contingent is long gone. You can even drive a car up there although this is not encouraged as this is meant to be a hiking trail. I went to city hall yesterday and talked with the city clerk, Gabe Adams, to see what the official situation was with the working lighthouse. The gate which previously blocked entrance to the lighthouse is no longer in place. No one seems to know what happened to it, but there seems to be no interest by the Coast Guard to replace it as they are attempting to divest themselves of the property. Gabe indicated that even though no one would get in trouble by going on to the property to look at the lighthouse, it is not official city policy to encourage visitors to do so. He said that if you return to Trinidad, identify yourself as an individual doing research on lighthouses, he would either take you up there personally or get some local resident to accompany you up there so you could take pictures. So it appears that you now can get right up to the lighthouse. 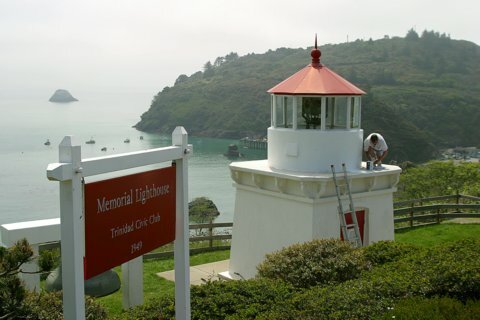 If we are ever in that part of California again we'll be sure to stop by Trinidad again so we can see the lighthouse in its entirety. Take US 101 into Trinidad. Take the Main St./Westhaven Dr. exit. If coming from the north, take a right onto Main St. If coming from the south, take a left, go under US 101 and onto Main St. In less than 1/4 mile you'll want to take a left (your 4th left) onto Ocean St. If you miss the turn, then just go to the end of Main St. and take a left onto Trinity St. Both will get you to the same place. Take Ocean Ave to the end and turn right onto Edwards St. You'll see the Memorial Lightouse ahead on your left. From the Memorial Lighthouse continue on Edwards St to the end and take a left onto Lighthouse Rd. Follow Lighthouse Rd. down to the parking lot. Park there and follow my instructions above in the Personal Note on how to walk to the viewing platform.